This boogie accompaniment in the bass is one obvious development of the Moving Pair material. You only need two notes at a time though – playing moving pairs right down in the bass will sound far too ‘muddy’. If you play the MIDI file for this example in MidiPiano, you’ll see that it’s played ‘two-handed’ – possibly quite enough for the keyboard player in a band to be playing, especially if they were singing as well. Playing the ‘kick’ with just the left hand is difficult but not impossible. The music shows both options in G and C positions. Instead of the kick, you can roll the left hand and anticipate the little finger. You can hear this effect in the next performance clip. Only by looking very closely at the ties between the lowest notes can you see how the music represents a rolled left hand. 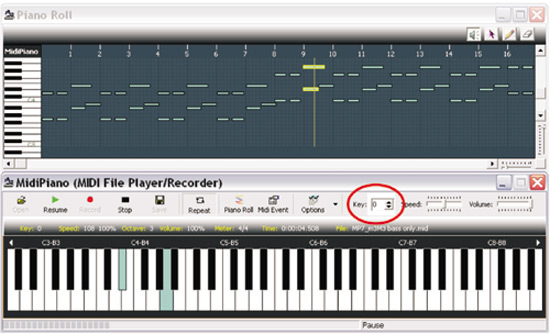 A MIDI performance and your own ear are as good a guide – and probably easier to work with! Once you can play left hand solo twelve-bar accompaniments like this, you’ll naturally want to start adding right hand material. Real, arranged two-handed boogies are coming within a few pages! A lot of left hand solo twelve-bar accompaniments use only two of the three of the Moving Pair notes. Here’s what that might sound like. Remember, you don’t have to do the little-finger anticipation to lay down a very acceptable blues/rock’n’roll rhythm. Pure boogie often uses this pair on a ‘shuffle’ beat. This audio clip alternates measures of ‘straight eight’ and ‘shuffle beat’ left hand patterns, straight eight first. Note that this is purely a listening-and-practising clip – you would never hear such a thing in performance! As you can hear, the shuffle feel is lighter and wants to ‘get on with it’ – it suits a faster tempo. Here’s an shuffle feel audio performance at a more suitable speed, using the ‘two only’ left hand and a right hand made from pure ‘Moving Pair’ material. You might be able to play this by ear straight away! Study the MIDI performance with MidiPiano and see if you can work it out. Shuffle rhythm is sometimes called ‘swing quavers’ or ‘triplet feel’ in jazz. Written out swing quaver/shuffle beat music is very confusing to read, so it’s often written as straight quavers with the ‘shuffle’ rhythm indicated by the ‘Swing quavers’ device shown on the right. and sounds like the audio performance immediately ABOVE, NOT like this, which is the straight-quaver version the music actually represents. Shuffle-beat style is harder to play than straight eight styling – the notes are closer together. You need to practice a lot, and, above all, listen very closely, to sharpen your playing up to performance standard. One decoration on the basic pattern it’s good to be aware of is the introduction of the major and minor thirds inside the left hand notes. This demonstration performance is eight bars long, and uses chords G, C and D. Can you write down the chord sequence? The ‘crushed’ minor third is used as a note in its own right. This is also the origin of this classic rock’n’roll/blues riff. The ‘major/minor thirds inside’ is a common decoration in shuffle-beat boogie left hands too. Here’s an example – it’s the music in MPR_M8_05, but with the ‘major/minor thirds inside’. This is another eight-bar demo example. Can you work out the riff and play a full twelve-bar chorus? As you listen to twelve-bar performances by the boogie-woogie greats like Albert Ammons, Pinetop Smith and Meade ‘Lux’ Lewis and the records of the early rock’n’roll pianists like Jerry Lee Lewis, Little Richard and ‘Fats’ Domino, you will hear dozens of shuffle and straight-eight boogie accompaniment patterns that you ‘sort of’ recognise..
Soloing aside, most of these patterns use material already covered in the Musicarta Moving Pair riff series, and as your ear ‘tunes in’ to the material, you will realise that you can – or almost can! – play them. You will want to get the material into your boogie ‘bag of tricks’ and start moulding into your own unique twelve-bar style. The trouble is, not all twelve-bar music is in the key of G! You have to be able to play the twelve-bar patterns in other keys, too. One easy way to learn to play the Moving Pair series twelve-bar material in other keys is to use the ‘Key’ utility in MidiPiano to raise or lower any whole MIDI performance file in pitch. Use the up and down arrows to change key. Here’s a table showing the number to use to transpose our G major twelve-bar material into various other common keys. Top musicians – in all genres – can transpose music into other keys in their heads, often without even thinking about it. Most of them have learned this skill by ‘going through the motions’ dozens and dozens of times. Using MidiPiano to transpose and copying the result will definitely work, over time. You will start to see how the black keys help make other notes sound like ‘home’ (the ‘tonic’). Put yourself on a regular regime, transposing simple music like these twelve-bar riffs. Repetition works! Transposing reveals the ‘bare bones’ of music – once you start to see how it works, all your musical learning speeds up. Musicarta presents many other opportunities to learn this key professional skill. (The Canon Project has a dedicated section.) Follow the Transposing tab on the main site navbar and use the Musicarta site Search page to find other Musicarta transposing exercises.